The Tree Fu Rangers are trying to win their ‘Green Fingers’ badge but the carrots on Ariela’s ranch have grown huge and gone crazy… with the help of some seeds from the Big World and Zigzoo’s Harvesting Hands invention! Tom needs you to help him perform Big World Magic to restore calm to Treetopolis. As soon as the Tree Fu Tom theme tune comes on Tigger stops in his tracks and gets ready to strike a pose. The Tree Fu Tom and the Carrots of Doom DVD complete with six episodes has had Tigger asking if he can watch just one more episode (please Mummy) which I usually given in and let him watch at least two each time he has had the DVD on. With Christmas coming up I think that his favourite episode has to be ‘The Sprite Before Christmas’ although he has happily sat and watched each episode. As a parent I really quite like Tree Fu Tom, alongside the various straps that the Tree Fu Rangers get into it gets the children up on their feet and joining in with the Big World Magic. With a host of actions getting them moving instead of just sitting watching another episode of the CBeebies animated series. To celebrate the launch of Tree Fu Tom and the Carrots of Doom on DVD, Boo Roo and Tigger Too are lucky enough to have one copy of the DVD to giveaway. 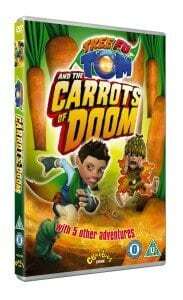 Disclosure: We received a copy of Tree Fu Tom and the Carrots of Doom FOC for the purpose of review. My kids shouted out twigs when I asked the question!!!!! My daughter loves Ariela, though she always does the magic moves with Tom! Twigs !!!!! the favourite in our house!! I like Tom the best. definitely Twigs – we love him! Tree Fu Tom is the favourite here. Tom himself Is our fav! Tom, whilst Twig is also liked.